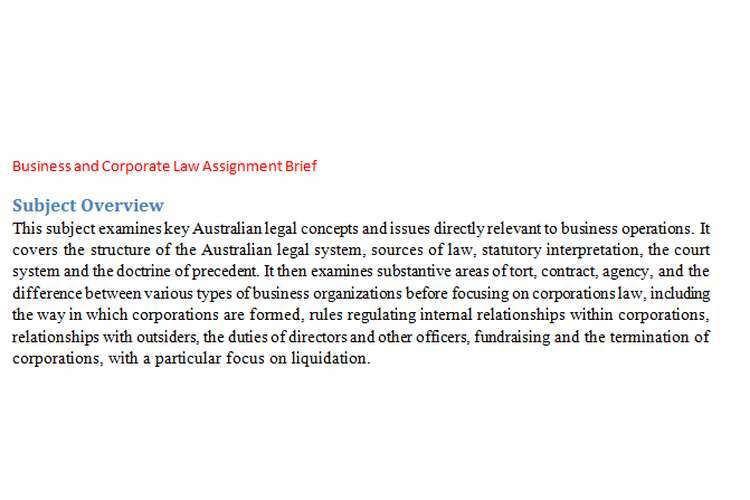 This subject examines key Australian legal concepts and issues directly relevant to business operations. It covers the structure of the Australian legal system, sources of law, statutory interpretation, the court system and the doctrine of precedent. It then examines substantive areas of tort, contract, agency, and the difference between various types of business organizations before focusing on corporate law, including the way in which corporations are formed, rules regulating internal relationships within corporations, relationships with outsiders, the duties of directors and other officers, fundraising and the termination of corporations, with a particular focus on liquidation. On successful completion of this subject, you should be able to describe the Australian and other legal systems, explain which court has jurisdiction in any particular matter and apply the doctrine of precedent; be able to demonstrate a capacity to engage in legal research; be able to understand, explain and apply the rules of statutory interpretation; be able to understand and explain the law relating to torts, contracts, property and corporations law; be able to identify the legal issues arising out of novel factual situations, to analyze the applicable law and to differentiate between which rules are applicable and which are not and then apply the law to the problem; be able to explain and summaries the applicable law in such a way as to create a report which states what liabilities arise from novel factual situations. To protect the academic integrity of the subject, you may be asked to complete an additional test (which may be verbal) if I or another member of the teaching staff has doubts that the work that you have submitted for an assessment item is your own. This test would be held within 4 weeks of the submission of the assessment. You must complete an on-line test which covers Modules 1 and 2. You must complete ten multiple choice questions online within 30 minutes using the Test feature on Interact2, between 00:01 on Monday 14 March 2016 and 23.59 on Sunday 20 March 2016 AEST. Make sure you SUBMIT your completed test within the specified time on limited time tests. Peter owns a construction business. He needs a truck to transport building materials. Each truck he uses earns him profit of $ 10 000 per week. Peter contacts Wendy, who owns a fleet of trucks. They have several telephone discussions about a Mercedes Benz 5000 truck that Peter is interested in buying. During one of these discussions, Peter asks Wendy whether the truck has a heavy duty suspension, explaining that he needs to transport bags of concrete to construction projects in rural areas. Wendy says that it does, without checking its specifications. Peter posts Wendy a letter containing a contract in which he offers to buy the truck for $ 300 000. The contract reaches Wendy on 5 November. She signs the contract at the space indicated for acceptance, and puts the acceptance into the post on 7 November. On 8 November, Peter phones Wendy and says “I haven’t heard from you and I’ve had second thoughts, so I am revoking my offer to buy the truck”. Wendy says “Too late, I’m delivering it today”. Later that day, she delivers the truck to Peter’s premises. Peter notices that the truck does not have heavy-duty suspension, and refuses to pay for it. Wendy’s letter of acceptance reaches Peter only on 10 November. Wendy has now sued Peter for $ 300 000. Because it is a busy time of year for the trucking industry, it takes Peter two weeks to find another truck to use for his business. Advise Peter as to his legal position, examining all relevant legal issues that could arise from these facts. United Surveyors is the name of a road surveying firm which undertakes contracts for the Albury City Roads Department. Smith, Jones and Peters have been partners in the firm for some time. There is an agreement between them limiting the authority of the partners to contracts up to $ 5 000. Smith regularly deals with Mary Bradshaw, manager of Capital Engineering Supplies. On numerous occasions Smith has purchased surveying supplies from Mary, who is aware of the type of work United Surveyors does. Smith buys a surveying instrument costing $ 6 000 from Mary. He has always wanted the firm to branch into oil exploration, as he is also a qualified mining engineer, but his partners have continually rejected such a move. Hoping to persuade them of the rewarding nature of such work, Smith decides to drill some test wells on a property that the firm owns, and to that end places an order for a $ 3 000 mini oil-driller with Mary. Jones and Peters have told Mary that she will not be paid for either purchase. Advise Mary as to her legal position, citing relevant statute law. Steve Jones, on behalf of WA Gold Exploration Ltd.
WA Gold Exploration Ltd was registered as a company by ASIC on 10 July, with Steve as 90% shareholder. He and the other shareholders met on 11 July, to elect a board of five directors. Steve himself was not elected to the board, because although he had originally discovered the opportunity, he had no experience in mining operations, and so did not want to be involved in day to day running of the company. On 14 July, the board signed a contract for a fleet of five ore trucks with Volvo Trucks (Australia) Ltd, costing a total of $ 500 000, to be delivered on 30 September. The board also established a sub-committee to determine the company’s technical needs, and on 25 July the board accepted the committee’s recommendation that the company not buy the $ 125 000 drill from Thor Mining machinery Ltd and should instead buy one from United Mining Machinery Ltd for $ 90 000. The board then contacted Thor Mining Machinery Ltd and told it that it would not be taking delivery of the drill or paying for it. Unfortunately, in mid-September it became clear that the gold deposit was not as large as hoped, and the board ceased trading on the basis that the company had only $ 400 000 in assets and had accumulated $ 2 million in liabilities. The company is therefore unable to pay for the trucks. Steve, who has personal assets of $ 1 million, has now been sued for breach of contract by both Thor Mining Machinery Ltd and Volvo Trucks (Australia) Ltd. Assume you are his legal advisor. Prepare advice for him citing full legal authority, as to what his legal position is. Part C has 5 problem questions. Students must attempt 3 of these questions. Each question is worth There is a sample exam in this Subject Outline which contains examples of the type of questions that may be in the exam, along with answers to them, which you can use as a revision aid. In addition, your lecturer will put revision information in the Resources file on the subject Interact2 site towards the end of the Session. E. is inconsistent with the federal system. E. can revoke it in none of the above circumstances. E. in arbitration the arbitrator attempts to mediate the dispute. E. an act that is never intended. E. must be of adequate value relative to what is received. A. The goods will become subject to any security interest held over the company’s assets. B. The goods will become subject to any security interest over the company’s assets. C. The goods will not be subject to any security interest over the company’s assets. D. If the company alienates the goods the holder of a security interest may take the goods. A. may take the opportunity after disclosing it to the board and obtaining the board’s consent. consent of both, and not voting any shares he (the director) has. E. may never take an opportunity that belongs to the company. D. unsecured creditors, employees’ claims, costs of liquidation. E. employees’ claims, unsecured creditors, costs of liquidation. E. the duty of care under s 180(1). E. none of the above applies. required date. If A’s friend, C, sues B to get him to deliver the car, what will happen and why? contractual obligation, giving an example of a reported case in which this has occurred. Explain the business judgement rule. Assume A is a limited partner in the firm of B and C. What are the rights and liabilities and powers of A ? Explain what is meant by equity capital and debt capital. Capital Technologies Ltd (CT Ltd) is an electrical engineering company. It is listed on the ASX. Its research department has developed a new type of battery. The research is presented to a Board meeting on 1 July. It is agreed that a public announcement about the battery will be made on 15 July. On 2 July, Don Trump, a director of CT Ltd, telephones his stock broker and buys 10 000 shares in CT Ltd from Sean Young at the current market price of $ 2.00 each. That same night, he tells his friend Gordon Gecko, who he knows is a regular trader in shares, about the new battery but Gecko does not act on the information. Upon the public announcement of the news about the battery, the price of shares in CT Ltd climbs to $ 22.00 each. A few weeks later, another shareholder, Sam Speed, who is an amateur scientist, reads an article in the latest issue of the International Journal of Chemistry which is available in his local library which says that an acid which Sam recognizes is one used in the batteries made by CT Ltd, is unstable. He sells his shares to Frank Jones for $ 22.00 each. Subsequently, when news reaches the market that customers of CT Ltd are complaining that the batteries have stopped working due to the unstable acid, the price of shares in CT Ltd falls to $ 15.00 each. Advise as to the liabilities arising from these facts, citing relevant legal authority. Patricia is a 48% shareholder in Opium Pharmaceuticals Ltd. She has been buying up shares in an attempt to gain control over the company. She tells you the following: It has come to her notice that the board of Opium Pharmaceuticals Ltd has authorized the issue of 10 000 shares to Johnny Investor, at a price of $ 50 per share (the large scale of this offering means that the disclosure requirements of Chapter 6D of the Corporations Act 2001 (Cth) did not need to be complied with). However, the effect of this issue is that her relative shareholding in the company has now dropped to 25%. The company’s accounts indicate that it has cash reserves of $ 100 million, and there are no new projects that will be undertaken. She also learned that Peter Somnium, one of the executive directors of Opium Pharmaceuticals, who was given the job of acquiring raw materials for the company, negotiated a contract for the purchase of opium poppies (used by the company to make morphine) at $ 500 per tonne from a local supplier, whereas research on the internet (which Somnium admits he did not undertake) indicates that the poppies are easily obtainable at $ 100 per tonne. The result was that the company paid $ 1 million more for the poppies than it need have. Patricia also tells you that when she wrote to the board advising it of this issue, and asking that they take action against Peter, she was told that the board had decided not to act. They have also ignored her complaints about the share issue to Johnny Investor, saying that the shares were issued in order to raise capital. Advise Patricia as to the legal issues arising out of these facts and what remedies are available to her. Shell Oil is a company which transports oil in oil tankers. An oil tanker can usually earn Shell Oil about $ 50 000 per week. Shell Oil signs a contract with United Shipping Construction for the construction of a new oil tanker. The contract is 400 pages long. On the day set for the delivery of the ship, the director of Shell Oil notices that it has a red funnel instead of the green one required by the contract. It will take a week to have the funnel painted the correct colour. Shell Oil has been told by one of its customers that if Shell Oil is able to take an especially large cargo of oil to Singapore, they (the customer) will pay $ 75 000. The managing director of Shell Oil wants to know if he can terminate the contract with United Shipping Construction and what other remedies he might be entitled to. Bond Corporation Ltd is a listed company. It established a full fee paying University outside Port Headland. On 24 August its managing director, Tracey Jordan, authorized the publication of the following advertisement in the Kimberley Times: We are proud to announce the establishment of Kimberley University, Australia’s newest private University. Invest in our education-services company by purchasing shares in any amount from as little as $ 1 000. Given the explosion in private tertiary education in Australia in recent years, we confidently predict a minimum enrolment of 5 000 students within the first year and a profit by the University within two years after that. On 30 August, Jordan subsequently telephoned Tina Fey, who he had known when they were students together at University, offering her $ 20 000 worth of shares, which she purchased. He also phoned Leo Spaceman, another friend, and offered him $ 500 000 worth of shares. On 5 September, Bond Corporation Ltd lodged a prospectus with ASIC, giving details of the share issue. On 20 September, Don Geiss, who received a copy of the prospectus bought $ 30 000 worth of shares. It transpired that the use of the word ‘University’ was conditional on the passage of legislation through the West Australian Parliament, which did not occur. he institution therefore had to operate as a tertiary College and only 1 000 students enrolled in the first year. he shares that Don bought are now worth only half what they paid for them. Advise Bond Ltd on the legal issues arising out of these facts.